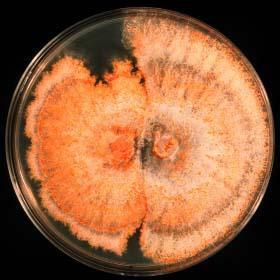 The Chestnut blight fungus (Cryphonectria parasitica; formerly known as Endothia parasitica) was likely introduced to North America on nursery stock from Asia and was first observed killing trees in the Bronx Zoo (New York City) in 1904. From there, Chestnut blight spread rapidly through eastern North America, and across the entire natural range of the Chestnut. It reached southern Ontario in the early 1920s; and by the 1930s almost all American chestnut trees were infected and dying. By 1950, this once prevalent tree species of the eastern forests was reduced to the status of a threatened species. However, American chestnut has a great regenerative capacity. Chestnut blight only infects the above-ground parts of trees, causing cankers that enlarge, girdle and kill branches and trunks. The surviving root systems can regenerate to produce sprouts that grow into small trees. These sprouts become infected and die but sometimes a few nuts are produced first. Today, this sprouting and infection cycle continues across the original range of American chestnut. Canker of Chestnut blight. The orange-coloured areas at the edge of the canker are where Chestnut blight is actively growing and sporulating. Of the three best known chestnut species, the American Chestnut (Castanea dentata) is the most susceptible to chestnut blight, and the Chinese chestnut (C. mollissima) is the most resistant. The European chestnut (C. sativa) is intermediate in resistance. Early attempts at controlling Chestnut blight involved crossing with the Chinese chestnut, with the expectation that some of the hybrids would show resistance as well as the upright form of the American chestnut. However, the results were discouraging. Recently, a new program involving several generations of backcrosses to the American chestnut was initiated in another attempt to combine resistance with good tree form. A strong program using tried-and-proven resistance-breeding methods is currently underway at several research centres in the USA . Scientists are also evaluating biological control for the management of chestnut blight. Some strains of the Chestnut blight fungus are infected with a virus which reduces the virulence of the fungus, so that an infected tree is able to produce callus, overgrow the cankers, and survive. This form of biological control occurs naturally in Europe and has allowed European chestnut to re-establish there. However, this method has not been as effective in North America and scientists are trying to determine why (see Hypovirulence). It is worthwhile to note the blight pathogen that virtually destroyed the American Chestnut in the nineteen hundreds is still present and active in the environment today. The blight continues to kill both longer living chestnuts and newer regentative sprouts. It is not likely that the pathogen will be stopped but it is hoped that a blight-resistant American Chestnut can occur and thrive in our natural ecosystems.